(Waldorf, Md., June 15, 2016) - On June 10th, 2016 the Southern Maryland Blue Crabs honored world famous boxer Muhammad Ali with a special on-field ceremony following the conclusion of the seventh inning against the Long Island Ducks. The ceremony was led by Charles County’s own Rock Newman of The Rock Newman Show and included a traditional ten bell salute. 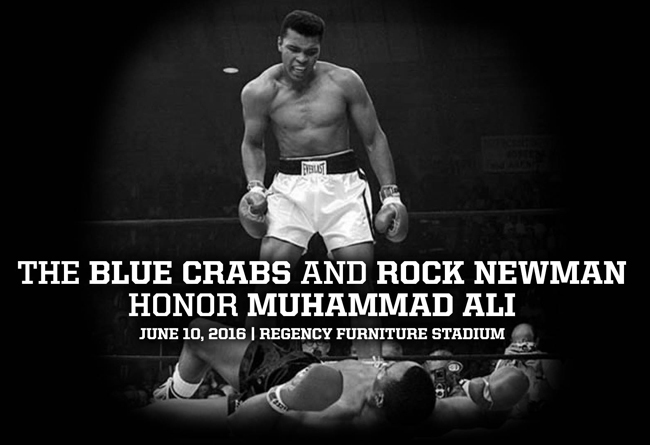 Muhammad Ali passed away on June 3rd, while the Blue Crabs were on the road against the New Britain Bees. Ali was a former heavyweight champion boxer. Born on January 17th, 1942 in Louisville, Kentucky, won two National Golden Gloves, two Amateur Athletic Union Nation titles, and had 100 victories by the time he turned eighteen. After high school, Ali went to the 1960 Olympics and won the gold medal for light heavyweight competition. He made his professional boxing debut on October 29, 1960. He became heavyweight champion of the world on February 25th, 1964, and defended his title in a rematch on May 25th, 1964—and continued to defend the title eight more times. "The Blue Crabs Organization had the good will and the commitment to give an honor to the greatest," said Rock Newman as part of the on-field ceremony. Newman is the former manager of Olympian Boxer Riddick Bowe, who won the World Heavyweight Title in 1992 and 1995. Rock Newman’s work can also be seen on his television program, The Rock Newman Show, every Wednesday Night at 8:00 on the Howard University Television Network. "I was happy to be a part of a wonderfully fitting tribute to Muhammad Ali" said Rock Newman afterwards in a phone interview. "It is the least the Blue Crabs could do to honor one of the world’s greatest athletes," said Blue Crabs General Manager Courtney Knichel. "We cannot thank Rock Newman enough for joining us for this special ceremony." The full video of the ceremony can be seen above. For more information, please contact Austin Gore at agore@somdbluecrabs.com or (301) 374-1129. The Blue Crabs return home to play the Bridgeport Bluefish tonight. For tickets, visit http://www.somdbluecrabs.com or call (301) 638-9788. The Blue Crabs play 140 regular season games in the Atlantic League of Professional Baseball Clubs. The Blue Crabs play at Regency Furniture Stadium in Waldorf, Maryland with affordable family fun. The franchise will look to open its ninth season on Thursday April 21st, 2016. Please call 301-638-9788 or visit http://www.somdbluecrabs.com for more information and to reserve your seat at the ballpark today!